Need more information about booking Home 7307740 ? A teak wood house, built to blend into the nature that surrounds it. It is hidden away at the foot of the hills that surround the Pai valley. 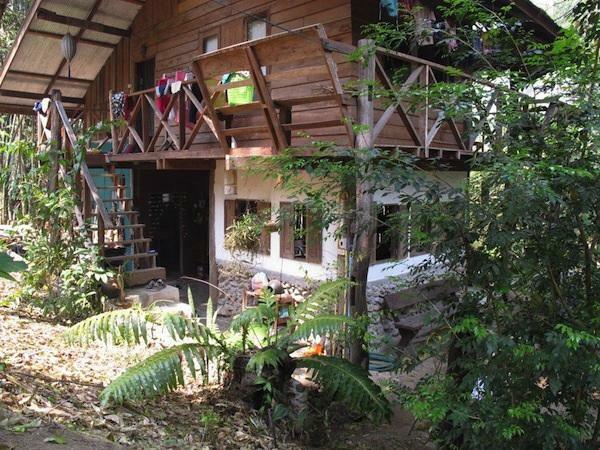 it was my home for 10 years and is now available for travelers who wish to stop for a few days, weeks or even months in Pai. Pai is a popular stop for anyone traveling in the north of Thailand. You can enjoy music, art, good food and good people here. The mix of Thai and western culture is perfectly balanced here. My house is situated just outside of the town in a friendly small village. It sits on a stream that'll provide days of walking adventures into nature. Next door, to the right, is the village temple - amazing architecture and an opportunity to learn about Buddhist culture. To the left are my neighbors and friends - a lovely family own art gallery that hosts a monthly exhibition inviting all the local artist of Pai to celebrate their work and performances. You can use the sauna that I built myself, eat the bananas that fruit all year round, or just enjoy the sounds of nature and hide away from it all. The house has a large bedroom upstairs, which can be split with a curtain for guests. A balcony that surrounds the whole upper floor. The kitchen and bathroom downstairs, built mostly from the rocks from the stream. It is a place to be with nature. In about 5 mins you are in town and 15 mins the other direction you'll arrive at the natural hot springs. You can hire bike, car or bicycle and park at the house. I live close by so can help out with anything. Hope you enjoy..